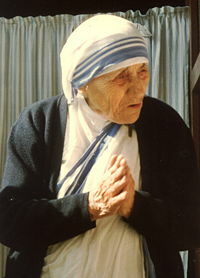 Yes, it's true - The first official games of the Indiana High School Basketball tournament were played when Mother Teresa was 9 months old, and she died almost exactly 6 months after the last game in the single-class tournament. EVERY high school basketball game played during the single-class tournament years was played while Mother Teresa was alive, and every game played while she lived was in a year covered by a single-class tournament! We don't know exactly what that means, but it sure is compelling! original material © 2007-9 Dan McGlaun.